After we discovered that our friendly Mr. Squirrel had outsmarted us and jumped over the squirrel baffle, Bill moved it up over a foot. 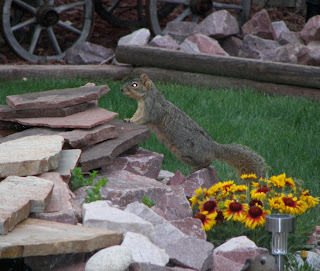 Surely this would keep the squirrel from getting to the feeders. Confident, we headed about our business and went to see our financial adviser (DON'T ask!!). 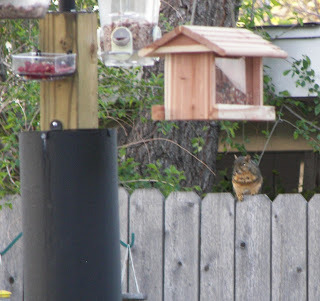 When we returned home - Mr. Squirrel was happily sitting in the feeder tray eating the seeds. After taking this picture, I chased him away with a broom. At this point, Bill declared all-out war on the rodents - which he "lovingly" calls "sport-model rats." We, once again, moved the baffle up - this time almost to the top of the pole. 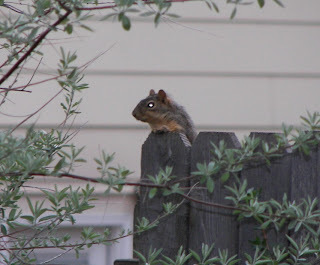 The rest of the afternoon we watched Mr. Squirrel look at the pole from all angles - figuring out how to make his move. 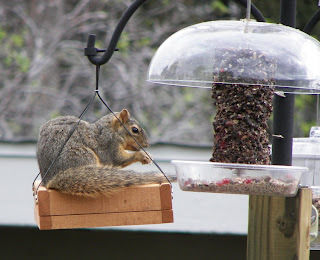 So far, he has not made it to the feeders - or maybe I should say - we haven't caught him! I'm sure there will be continuing chapters to this story. 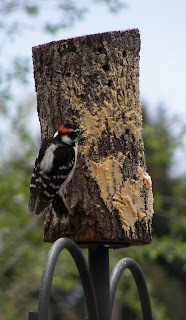 The Downy Woodpecker was back. 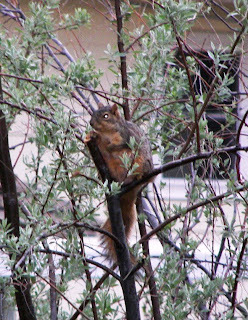 He sure does like the Birdacious Bark Butter! The Downy and Hairy Woodpeckers are very similar - but the Downy has a shorter bill and is about 3 inches smaller at 6 1/2 inches. 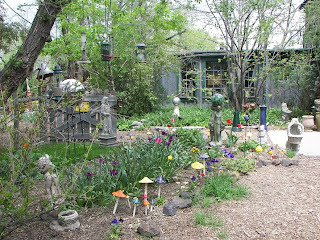 One of Bill's friends told him about a neat bird place off Palmer Park - so we went to visit. What a neat place! 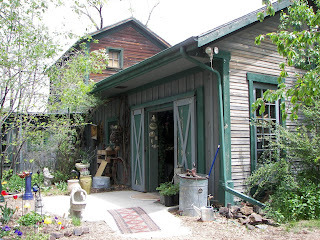 The house was built in 1909 and originally had over 300 acres of surrounding farm lands. The store had everything you can imagine having to do with birds - including dozens of blends of seeds. 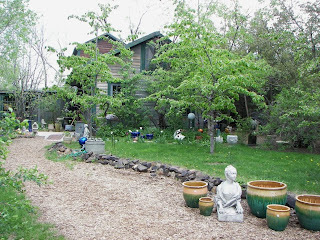 Since this was our first visit, they gave us 4 pounds of select seed free. We also purchased a wren house and a contraption to keep the ants from getting into the hummingbird feeder. This is the entrance to the store. 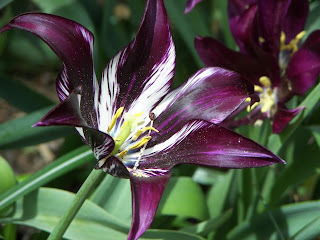 I couldn't resist taking a picture of this beautiful tulip. Look at the colors! We will definitely go back to this place!